At NH Case we take our fish very seriously – and as experts in the industry with over 60 years’ experience of processing fish, we are as concerned as you are to make sure that the fish we process and sell is genuinely sustainable. MSC accreditation is probably the best known external guarantee of sustainability. Its mission statement is to safeguard the world’s seafood supply by promoting the best environmental choice. MSC employ marine scientists to monitor a specified fish stock and decide if that stock is sustainable. In order to be accredited, all sectors of the relevant fishery must be audited by MSC and pay a licensing fee. 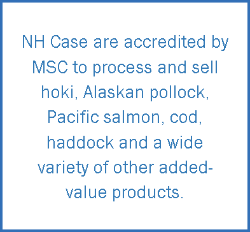 All fish that NH Case sell is traceable to a government issued catch certificate, which states exactly where and when the fish was caught and which boat was used. The use of catch certificates ensures that no illegally fished product can be landed or imported into the UK. The Icelandic Government has gone a step further and has introduced a licensing scheme for all participants in fish production called Icelandic Responsible Fisheries. The scheme uses a structured fisheries management system to ensure that the nation focuses on the sustainable utilization of the fish stocks. NHC Case were involved in discussions with the Ministry of Fisheries in Iceland regarding the creation of this accreditation scheme, and are proud to have been the first UK company to be licensed and to be able to use the Icelandic Responsible Fisheries logo. are from this responsible, sustainable source.